Have you come across this blog yet? 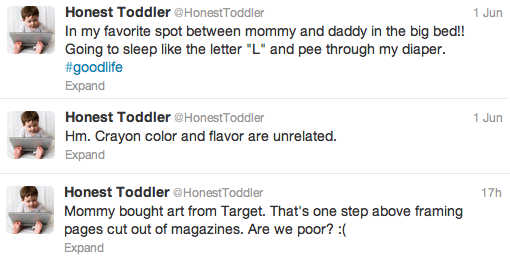 It's called 'Honest Toddler', and it's a hoot. It's life through the eyes - and words - of a toddler, and [as you'd know if you're a parent to one], what emanates from the mouth of a little one is as 'pure' as, which means there is no filter, there are no niceties, and a there's whole lotta honest going on. Like it or not. I'm deeply sorry that my circadian clock is so offensive to your lifestyle. Please accept my humble apologies for not being the robot child you envisioned. Parents, please stop saying "We'll see" if what you mean is "Not in your lifetime." I just can't anymore. "I'm not going to repeat myself." If only that were true lol. Is it too much to ask to be held from 4:30-7PM? Don't make a big deal out of my art if you're just going to throw it in the trash. Asked if fish have butts. They laughed. That's the last time I put myself out there.